This is the largest Moon Phase Watch in the world, and it is ABSOLUTELY SPECTACULAR! 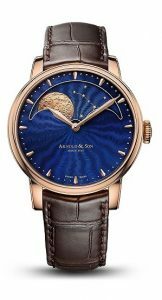 UNWORN, IN ABSOLUTE NEW CONDITION, with Original Arnold & Son box & warranty papers. It is a polished red gold, 43mm case, beautiful blue enamel dial, traditional wind, mechanical movement, and exhibition glass back. Available on elegant crocodile leather strap with pin buckle. Retail $31,000. OUR PRICE $22,800. Excellent Buy! To purchase this watch CALL US 956.687.2981.